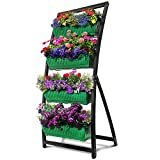 The cool new Flower Tower is a freestanding vertical planter that lets you take your flower garden to new heights and save space as well. 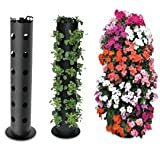 Each tower planter holds up to 30 plants and features a unique internal watering tube with graduated sized holes at various heights that allow you to easily water from the top and not miss a single plant. An innovative and unique way to display your blooms around a patio, deck, balcony or pool.